Coco is a Foster dog from easternherdingdogrescue.org who needed a safe place to whelp and care for her pups until they reach adoption age. We were glad to participate and promote the many people and organizations that make the world a better place for people and pets. 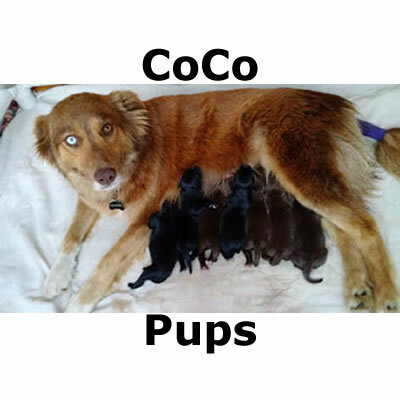 This page will chronicle CoCo and her pup’s journey to get prepared forever homes. CoCo arrived 3/24/2015 in late term pregnancy. Her conception date, history and temperament were unknowns. Our first goal was to settle her in and make her comfortable. With two dogs, two cats and two children in the house “calm” was the word we used to help CoCo ease into her surroundings, which she did. We set up a whelping room for her to get familiar with. We took her to see the vet on 3/35 where between 6 and 8 pups were detected by x-ray. (It is not always easy to detect everyone). CoCo and her 7 “CoCo pups” were born on 3/27 and 3/28 Click here to see the birth video. Click here for an exciting announcement about one of the pup’s future. Click here for a Week 2 Pup-date on the babies and CoCo. Go to www.Youtube.com/TheSocialPetNet to watch all the latest Social Pet Videos. Watching from PA! 🙂 Miss you Carters! What happeNed to the live streaming? Back up and watching from VA! I think it’s awesome that you are broadcasting this! Can’t wait to see the puppies! Hang in there CoCo! thank you so much. The internet has not been kind, but we are doing our best to keep the link live. The fresh link is on this page. It does change from time to time. From inside the whelping box, we are hanging in there. Lots of puppy movement which is always encouraging, she’s begging for people food, catching naps when she can. We are glad all of you could join us on our adventure, it will be a wild ride shortly once things progress to the point of no return. Stay tuned! Watching from downtown Roanoke to keep track! Coco is enjoying some pampering before she has the babies. Yes she is. She’s had a pretty rough time of it the past few weeks and months as we understand it, so we are trying to give her the most opportunity to gain strength to deliver well. She is an eastern herding dog rescue foster we received 2 days ago on the evening of the 24th of March. She looks to be full or close to full Australian Shepherd. She has a very sweet disposition. Good with kids. (Although we only have her in full term pregnancy. Her history beyond that a little sketchy. I am watching! Thank you guys for what you are doing! You are very welcome. We admire the whole team for making a difference in both the dogs, and in people’s lives. how long does this process usually take? Is there a way to tell when birth is imminent? There is an even better photo of her gorgeous eyes on Easter Herding Dog Rescue facebook page. She’s beautiful! Coco, come on girlie, you’re scaring me, you’re getting weaker. Push those babies out. Would watching her on camera from another room help her? if I’m tired from watching all night I know she is exhausted. Thank you. I see your face book page. Are you on G+ as well? Not sure I think only Facebook. Brooklyn is hoping the puppies come soon so mom will give her some work to do. Bailey on the other hand laughs, says, “yeah right, when Brooklyn came mom watch the birth then spent hours each day watching her litter eat and play. Even took trips to Canada to spend time with the babies. Then mom and dad brought home a bratty, pushy puppy who doesn’t need sleep, even at almost three years old.” Coco, we all thinking of you. Brooklyn’s dad asks about once an hour if the babies are coming yet. We you’re biggest fan. BTW finally figured out how to post with our profile picture using FB. Watching from Richmond, VA with baited breath! Hoping for a safe delivery. Prayers and prayers. We’re excited too. The new link is up! The large dog jumped in her bed while you were outside. Just fyi. That’s true. Thanks. He was waiting at the door when we got back too. True is his name. He’s a Belgian Tervuren. Im watching you! Yay puppies on the way! Maybe a red litter. WOOHOO! Love the baby cries. Would having a load of towels in the dryer help with warming babies? Squeeze the babies for me. Ah, this letter will have two birthdays. Cute! We went to sleep around 130. What was the total puppy count? 7 Puppies, 4 girls, 3 boys. I am sure you are getting asked this 100 times a day, but any clue on daddy? CoCo is a foster rescued from a shelter so we don’t have facts, but it looks like the daddy was a lab. I played the live feed tonight and turned up the volume. Brooklyn was already in bed, she came running in the room and jumped in my lap to see where the noise was coming from. I have sound files of her litter making the same noises and play it for her sometimes. I know what you mean. Image, our Border, hears the audio feed from the control room and sits there cocking her head back and forth like a bobble head. I have to watch on the sly, as hearing them will set Brandie off barking – and we’re having a neighbor problem with her barking! Dogs are really attuned to those noises. I keep the volume pretty low. You can set the volume on the video itself if you want, that way everything else sounds normal. Thanks for tuning in!